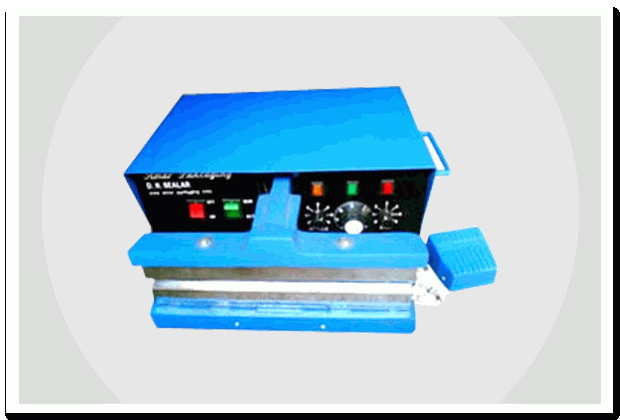 Auto Direct Heat Sealer|Shrink tunnel machines|manufacturers and suppliers, in Mumbai, India. Supplier & Manufacturer of Auto Direct Heat Sealer. Our product range also comprises of Heat Shrink Tunnel Machine, Shrink Tunnel Machine and Shrink Tunnel Heavy Duty. Auto Direct Heat Sealer suitable for pouch Sealing machine high Quality of Sealing. Accurate sealing of pouch packaging machine like Tea, confectionery, wafers, snacks, powder. This machine is auto operating system and manual operating system both can be provide very fast production and low maintenance. Aluminum foil Bopp & Polyester pouches you can seal it. These are direct heat sealers. Heat controlled by the accurate electronic thermostat. Heat distribution is even in this direct sealing system. Multilayer, BOPP & Polyester pouches.